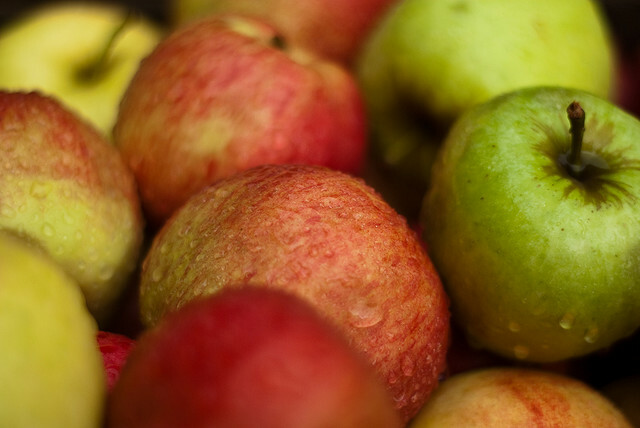 The great abundance of apples which was produced locally in the 19th and early 20th centuries was not only sold as fresh fruit, but a larger proportion was processed for cider and cider vinegar. Among local cider mills was the Cushman mill at Rock Village. 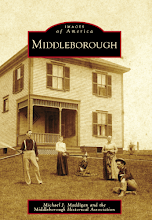 Constructed in 1857 on the west side of Miller Street just south of Cushman Street, the mill was Middleborough’s last remaining cider mill, operating until 1944. 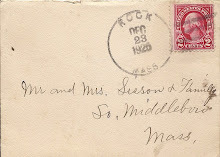 The mill was owned by three generations of Cushmans: Isaac Smith Cushman (b. 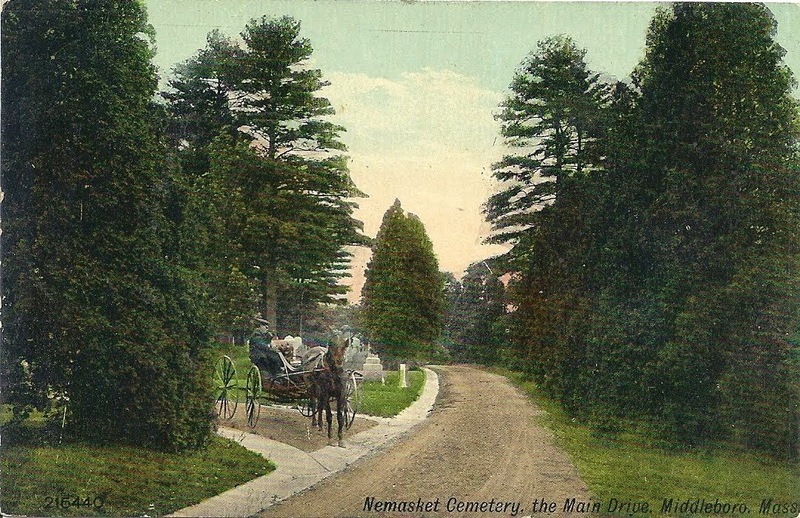 1816), son Charles Franklin Cushman (1850-1930) and grandson Harlas Lester Cushman (1875-1955). 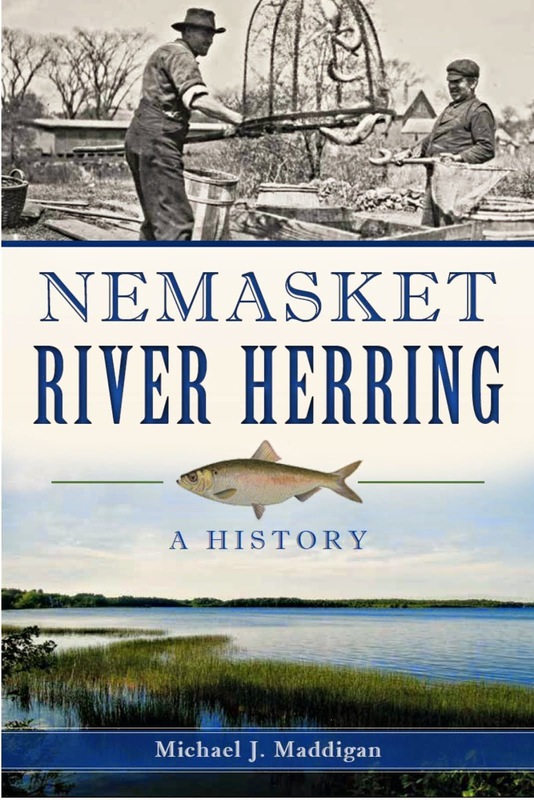 Both Isaac S. and Charles F. Cushman were originally occupied as foundrymen, though later in life each became increasingly engaged in farming. 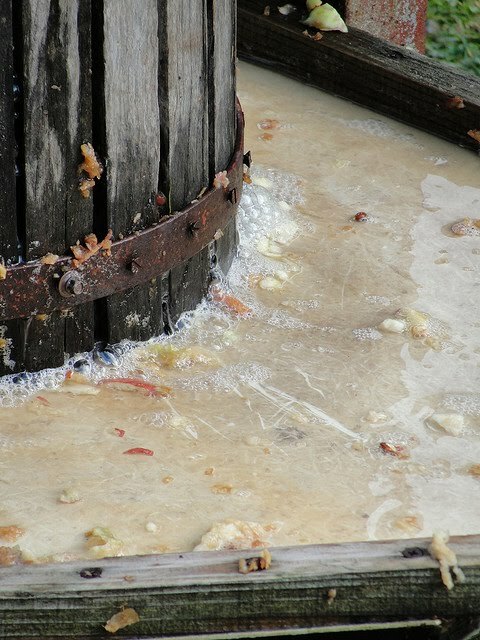 The cider mill constructed by Isaac S. Cushman was a natural adjunct to farming at Rock, and the principal product of the early mill appears to have been cider vinegar, produced by allowing the apple cider to ferment. The method of making cider then was primitive. Heavy oak rolls, turned by a horse moving in a circle, tread-mill fashion, crushed the apples. This ground-up pumice was then placed in a frame on a platform press and lined generously with rye straw applied in layers over the pumice. The process was repeated, until the press was full. A header with two wooden screws attached was placed on top of the contents. Two wooden levers, each threaded through a screw eye, were turned by hand power to extract the juice, which ran into a trough below. 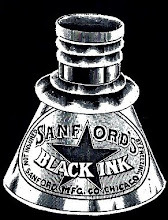 The liquid, escaping by an outlet to a tank, was then dipped up into barrels or containers to be taken home for use or for market. It was a laborious task to swing the levers in the crushing process and strong arms were needed by two men who did the work. While the mill as operated by Isaac Cushman was necessarily a small-scale operation given the primitive process by which cider was produced, under Charles F. Cushman the mill received greater attention and its operations were expanded and modernized. 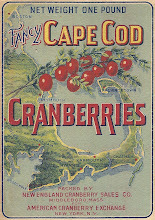 In November, 1907, Cushman refitted the upper story as a cranberry screening room where his berries could be processed. A gasoline engine was installed to power not only the screening machinery, but the cider press as well, thereby boosting the output of cider. While Charles had been previously listed in census and other records as a “farmer”, in 1910 he informed the census taker that he was a “bottler – cider mill”, an indication that the mill had assumed an increased importance as part of Cushman’s farm operation. Consequently, fundamental a change was made in 1911 when Cushman and his son Harlas mechanized the mill. 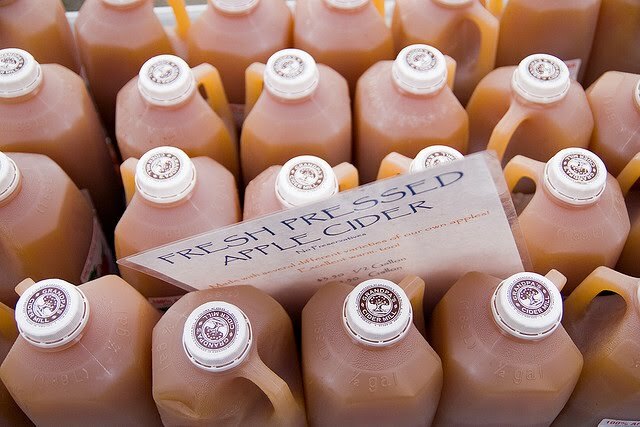 Hydraulic presses powered by electricity were installed and “by the new method it was possible to crush 20 bushels of apples at a time and turn out 80 gallons of cider. On peak days, 1,000 gallons could be produced, or a barrel every 12 to 15 minutes. At one time, in an effort to gauge how quickly cider could be produced, Charles Cushman rushed work and pressed 36 barrels full in half a day, a staggering amount. The production of cider in the newly mechanized mill began with the receipt of cider apples in the mill yard. These were dumped into a conveyor which lifted them to the second floor where they were pulped by “a 2,300 revolution-a-minute chopper.” The apple pumice was then sent to the ground floor where it was packed in canvas sheets and became known as “cheeses”. “When enough cheese sections, from eight to ten, have been prepared, which takes only about five minutes, they are placed under the power press, operated by a hydraulic ram, and the pulp is squeezed dry enough almost to burn, while they are cutting up and preparing another portion to take its place.” The juice was collected and pumped into a 150 gallon storage container from which it was drawn off into barrels “to be soured and allowed to vinegar off.” By these new means, Cushman could produce over 1,000 barrels of vinegar each season. 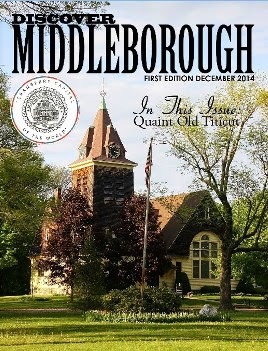 The modernization of the mill was reported in the Middleboro Gazette which declared the new press “a wonder of its kind”, but the early operation of the hydraulic press was not without incident. On November 8, a short time following installation of the new machinery an accident occurred, though fortunately no one was injured. The mill is operated by power, and the crushed apples are confined in heavy cloths to be squeezed. When the pressure was applied the edge of one of these cloths gave away, and the contents shot out, but fortunately no one was struck. It landed in a heavy mass on the opposite wall. Ernest Morgan was working close by but he was just out of the range of the charge. 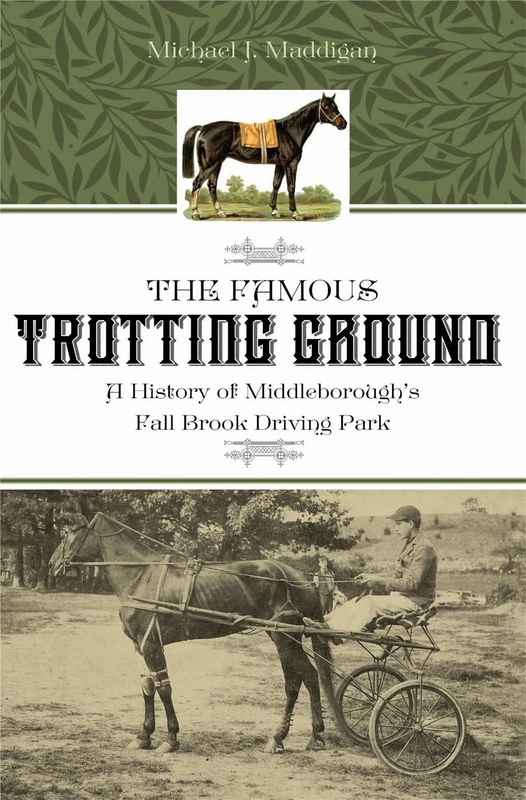 Additionally, the Cushmans had earlier established their own orchard to meet a portion of the mill’s demand. In 1909, Harlas Cushman is recorded as setting out an apple and peach orchard of some 1,300 trees, the apples ultimately being processed for vinegar. In 1944 operations at the Cushman cider mill ceased. The press and other machinery were later removed from the mill, and the “weather-stained” building was demolished in the mid-1950s. "Cider" by Paul Goyette, October 27, 2007, republished under a Creative Commons license. This view of the Cushman cider mill depicts it after it had been neglected for over a decade. The detailed ventilator on the roof ridge, however, hints that the building in its prime was probably well kept with some pretense of architectural stylishness. Following the death of Harlas L. Cushman in 1955, the mill property was sold and the new owners levelled the building. "Raw Cider" by Trevor Dykstra, republished under a Creative Commons license. 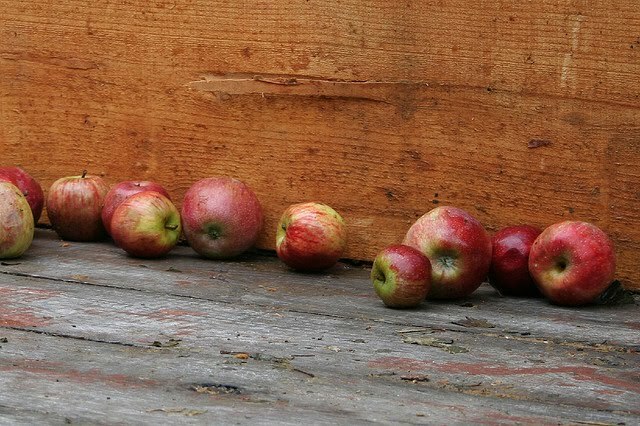 "Cider Apples" by zizzybaloobah, October 9, 2005, republished under a Creative Commons license. "Conserve Your Cider Apples", advertisement, Middleboro Gazette, October 4, 1918, page 5. 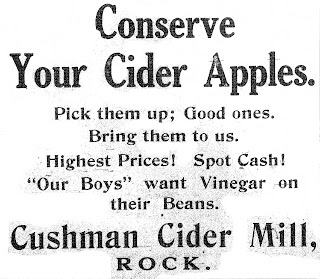 Cushman paid what he advertised as high prices for the cider apples he needed to produce vinegar in the Rock mill, and paid in cash. For those growers not persuaded by these enticements, Cushman appealed to their patriotic instincts with the fact that American servicemen, then in the final months of World War I, "want Vinegar on their Beans". 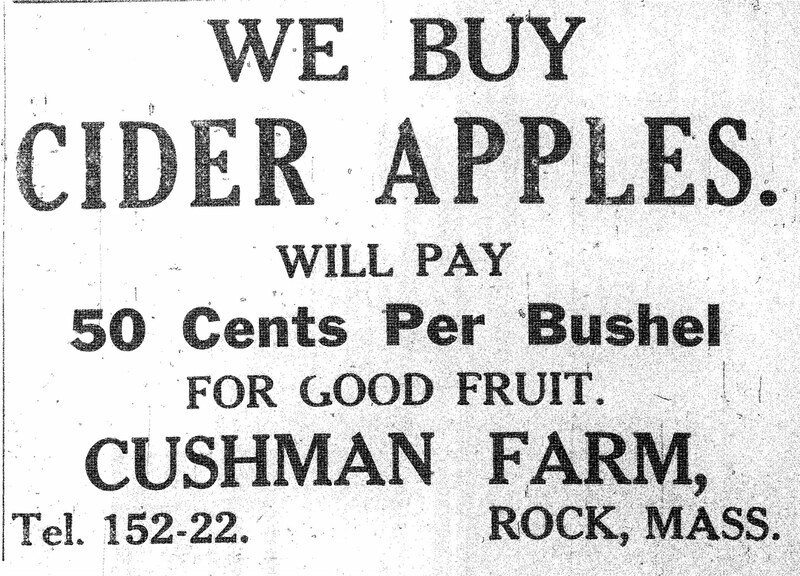 "We Buy Cider Apples", advertisement, Middleboro Gazette, September 23, 1921, page 4. 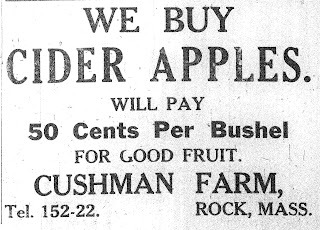 Cushman's ads for apples continued to emphasize the high price paid, in this instance 50 cents a bushel. "Wanted! First Class Cider Apples", advertisement, Middleboro Gazette, August 19, 1927, page 5. 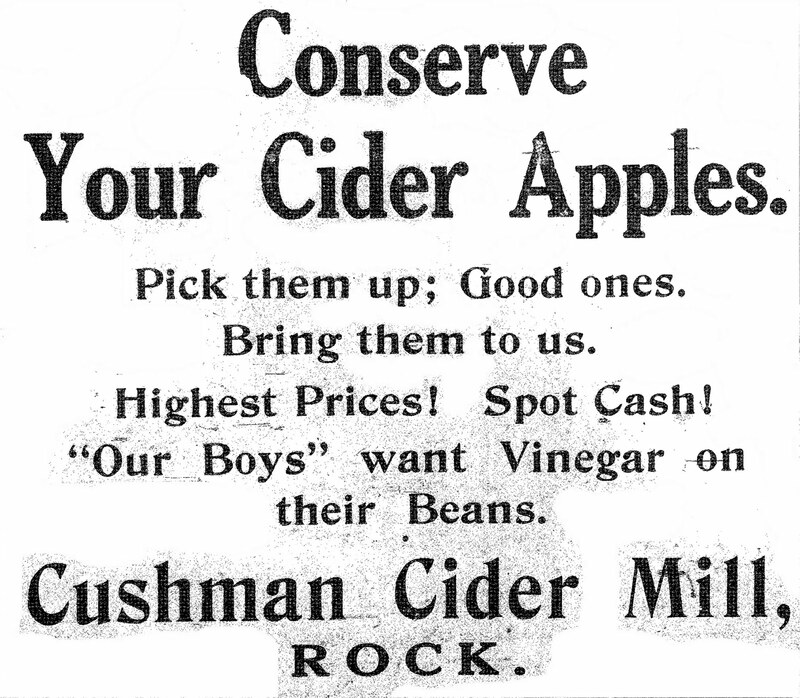 To produce the quality cider vinegar which he wished to sell through higher end grocers, Cushman required quality apples as indicated by this advertisement from 1927. "Fresh Apples I", photograph by Ben Garney, October 17, 2009, republished under a Creative Commons license. Cushman, Henry Wyles. Historical and Biographical Genealogy of the Cushmans: The Descendants of Robert Cushman, the Puritan, from the Year 1617 to 1855. Boston: Little, Brown, and Company, 1855. 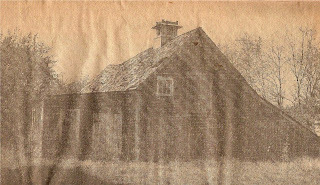 Phillips, Jennie M. “New Owners to Wreck Rock Cider Mill Built in 1957”, New Bedford Standard-Times, undated clipping. Thirteenth Census of the United States, 1910. Records of the Bureau of the Census, Record Group 29. National Archives, Washington, D.C. Census Place: Middleboro, Plymouth, Massachusetts; Roll T624_612; Page: 4A; Enumeration District: 1229; Image: 595.